Google's new piracy-fighting search algorithm, which downgrades illegal content, is unlikely to affect its YouTube service. The company announced late last week that it was changing the way it ranks search results, in order to punish sites that are consistently accused of copyright infringement. If a site racks up enough DCMA (Digital Millenium Copyright Act) strikes then it'll be demoted within Google Search. Google is disclosing a running total of the sites with the most strikes against it. However, within its reporting form, Google has issued a special message, exempting YouTube from the process. 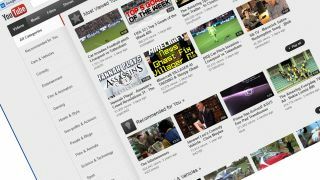 Naturally, YouTube is the home of much of the web's illegally uploaded content, but the form directs users with YouTube complaints to a different complaint mechanism. It appears that this is because when a video is flagged for removal in YouTube, it already counts as a takedown, whereas that's not the case with external sites. Google says: "We're treating YouTube like any other site in search rankings. That said, we don't expect this change to demote results for popular user-generated content sites."